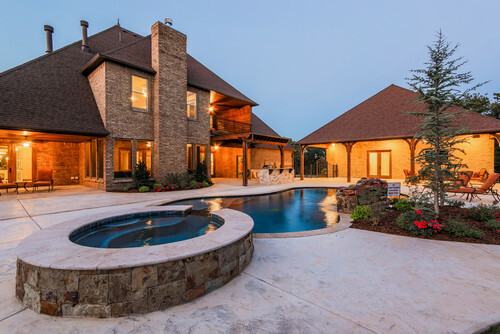 As one of the most popular in-ground options, poured concrete pools run the gamut as far as style and pricing, but Angie's List estimates the average cost at between $20,000 and $50,000, depending on the size and extra features (who doesn’t love a waterfall?). 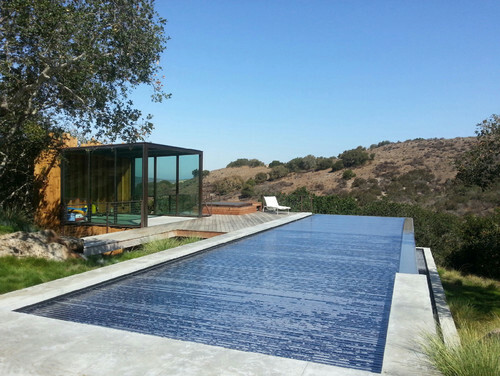 With aesthetics that complement almost any outdoor space, concrete pools make for a solid investment. They can be high-maintenance, however, requiring repainting, resurfacing, replastering and acid washing every 10-12 years. Their surface can also feel rough and scratchy, an off-putting characteristic for some homeowners. Although pools that sit above ground will cost less overall—requiring little to no site preparation and smaller equipment—there are fewer options and none last as long as in-ground pools. Depending on the size, you could spend as little as $100 or as much as $10,000 (for one that sits in a wraparound deck), though you might enjoy them only for a few summers. 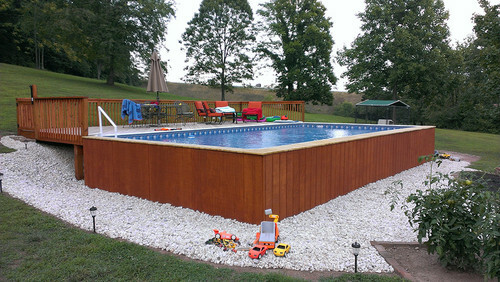 A fiberglass pool consists of a large, one-piece insert that sits in the ground. With a smooth surface that requires fewer chemicals to maintain, fiberglass pools cost more up-front but save you money long-term. In fact, some experts estimate a 70 percent savings on chemicals and 30 percent savings on electricity over the pool’s lifespan. Depending on the size and accessories, this option can cost between $20,000 and $60,000 for professional installation. A pool lined with vinyl is the least expensive in-ground option because it uses lower quality material and isn’t permanent. With installation costs ranging from $15,000 to $25,000, the savings may not justify the negatives. Namely, vinyl pools require more chemicals to maintain and need replacing every few years, though replacement costs only run about $4,000. In addition, vinyl varieties tend to score fewer points on aesthetics than fiberglass or concrete styles. When budgeting for a private pool, you should include the cost of accompanying equipment like cleaning tools, pool covers, vacuums, chemicals, and surrounding patio/fencing. Depending on the size and style of your pool, cleaning accessories and covers could cost as little as $400 each or escalate into the thousands. For the chemicals (chlorine and pH strips), these can cost between $80 and $100 per month for the average in-ground pool. Updated in 2019, homeadvisor.com estimates the average cost of maintaining a pool to be between $1200 and $1800 per year, with additional repairs averaging $1800 to $3200 a year. If you opt for water features like a hot tub or waterfall, these numbers can increase as much as $1,000 to $8,000 a year.